Square wedding cakes are a way to make your wedding day a little bit different. 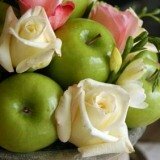 Traditionally wedding cakes are thought of as being round, however cakes can come in many different shapes including square. The same options apply when talking about a square cake as with a round cake. 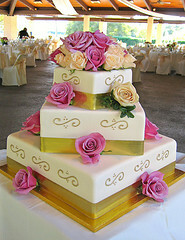 You can still have a multi-tiered cake as well as other wedding favorites like fondant icing. 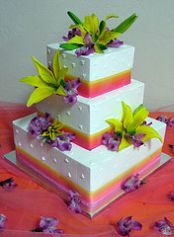 Your first step should be to find a baker or cake artist that specializes in square cakes. It is definitely a little bit different to work with a square cake, so make sure the person you pick to make your cake knows what they are doing. 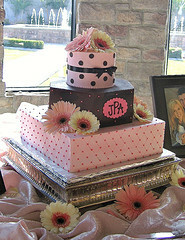 If you want a multi-tiered cake, square cakes work well with all tiers being square. Another option is to have square as well as round tiers (as shown below). Adding accent items to your cake is always a good idea to make it unique. 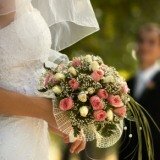 Flowers (fresh or fondant), cake toppers and other items can help to finish off your wedding theme. 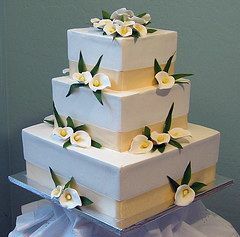 The photo below offer a glimpse at a calla lily themed cake, complete with fondant calla lilies. A tropical beach-themed cake accented with tropical flowers can also be a lot of fun.